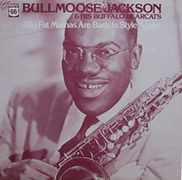 Bull Moose Jackson's nine hit records in the late 40's were such lively, good-natured, toe-tappin' tunes that today, some 50 years later, they still draw new fans to the field of Rhythm & Blues. 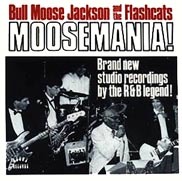 In 1984 the Flashcats brought Bull Moose Jackson out of retirement with the hit 45 Get Off the Table, Mabel (The Two Dollars is For the Beer). That record revived his career, and led to the LP Moosemania! in 1985. Final Recordings contains that LP, the Mabel 45, and the only two songs recorded for a follow-up LP. Bull Moose's declining health prevented any further recording. This CD presents the last recordings ever made by this late, great R&B legend. The record album that brought Bull Moose back to the music world. 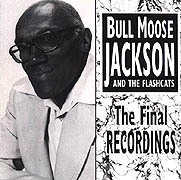 Studio recordings of new songs written for him by The Flashcats, plus new recordings of several of his classics, PLUS the only-ever live recordings of Bull Moose. Includes Big Ten Inch Record and Get Off the Table, Mable (The Two Dollars is For the Beer). Moose's first recording with The Flashcats. "This new single is a signal that the one and only Bull Moose is back. Jackson unleashes two fine sides in the famed Bull Moose tradition . . . Cute lyrics, enthusiastic band shouts and a bootin' sax bridge all work to add another double-entendre gem to the Bull Moose stable." Original recordings from the 1940s. released in Sweden on Saxophonograph Records in 1985. 12" LP licensed from King Records and released in Sweden on Route 66 Records in 1980. These buttons are for purchases shipped within the US only. 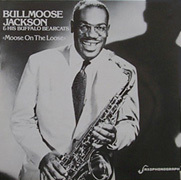 Visit the Bull Moose Jackson Web site!